Phishing attacks have become the primary hacking method used against organizations. In the past, there was a tendency to blame the user, but attacks have evolved to appear so genuine that even the most securitysavvy recipient can be fooled. 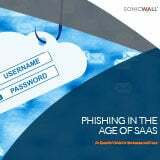 Phishing attacks have recently experienced newfound success with the proliferation of SaaS in the workplace. Phishing attacks are on the rise for businesses, as threat actors focus their efforts on more profitable targets. Prevention and remediation tips for phishing victims.